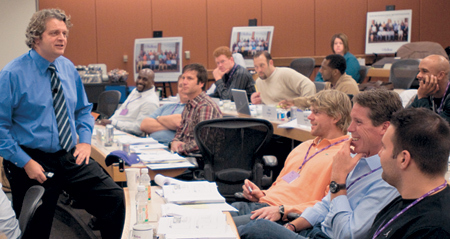 Throughout the year, leaders from some of the world's most prestigious organizations, including Kraft, BP and LM Ericsson, can be found in the classrooms of the James L. Allen Center. The executives aren't guest speakers; they have come to learn from the Kellogg School's top faculty how to transform their companies. They are taking part in custom programs designed to help their organizations stay competitive in the challenging business world. Education through custom programs is a lever a firm can use to transform itself, whether it is seeking a strategic, cultural or organizational change, says Stephen Burnett, associate dean of executive education and professor of strategic management. Programs can range from three days to three weeks, and enrollment can reach into the hundreds, depending on the needs of the organization. "There is a growing recognition among organizations that it's very hard to implement a significant change without an education component as part of the initiative," says Joseph Hannigan, associate director of executive education and senior lecturer. "Custom programs affect the organization very directly and within a time frame where benefits are visible." Kellogg was among the first of its peer schools to offer custom programs, starting in 1973 with the USG Corporation. This proven track record has helped the school cultivate long-term relationships with major clients such as International Paper and General Electric. After 9/11, the FBI turned to Kellogg as it sought to sharpen its focus on intelligence gathering and attack prevention. In March, National Football League players attended a three-day program at Kellogg to focus on their post-football careers, addressing topics such as maintaining one's brand and working with family and friends. To design these programs, Kellogg faculty and staff work in collaboration with each organization, performing "discovery work" six to eight months prior to the first class. A faculty team travels on-site to interview top executives and review company information to design a curriculum that can help achieve the firm's goals. Professors often observe that in certain areas, the organization is already moving toward the desired change, and they discuss those examples in class. "It's one of the ways that we make these programs more effective by demonstrating to the client that they can do this. It's not just all theory," Burnett says. "It shows that there are people in your company who are doing what we are teaching and you have their know-how at your disposal. You can ask them questions and follow up with them." Ernst & Young has been sending partners from around the world to Kellogg for more than 20 years. Through the Kellogg-designed curriculum, partners learn to view their clients through the lens of the chief executive. This leads to more strategic conversations with clients, and a stronger network among partner peers, according to Susan B. Heil, Americas Enterprise-wide leader and director at Ernst & Young, who is responsible for the non-technical learning programs at the firm. "Development is key to our success," Heil says. "If we are not teaching and developing the next generation, then our firm won't be as responsive to new talent, new clients or our regulators. Our leadership has been terrific in this downturn (with its determination to) keep education, learning and development as a priority and to invest in it." By now, about 1,200 Ernst & Young partners have graduated from Kellogg custom programs. In a time when firms are cutting their budgets, organizations often see training and education as a discretionary expense. But Kellogg custom program administrators say education is crucial for an organization to remain competitive.